V.I. Carnival Queen Jikelle Michael takes part in the evening wear segment of the program. *Correction, see editor’s note* Three young women went up against April showers and technical difficulties during the 2018 V.I. Carnival Queen show Saturday, with Jikelle Michael of Ivanna Eudora Kean High School taking home the crown. Candacie Williams portrays Helen Sebastien in the Lady of Yesteryear segment. It was the first time the crown has gone to an IEKHS student in more than 20 years. Michael also received the awards for Miss Photogenic, Best Personal Interview, Best Swimwear, Best Talent, Miss Intellect, and Best Evening Wear. Candacie Williams took home that People’s Choice Award, and Jahnique Frances received the honors for Miss Cooperative, Miss Congeniality, and Best Lady of Yesteryear. The swimsuit segment was hosted by Miss Universe United States Virgin Islands 2017 Esonica Veira. Each contestant was judged on her modelling technique in zebra-print swimsuits. Veira returned to the stage later to host the eveningwear segment. 2018 V.I. 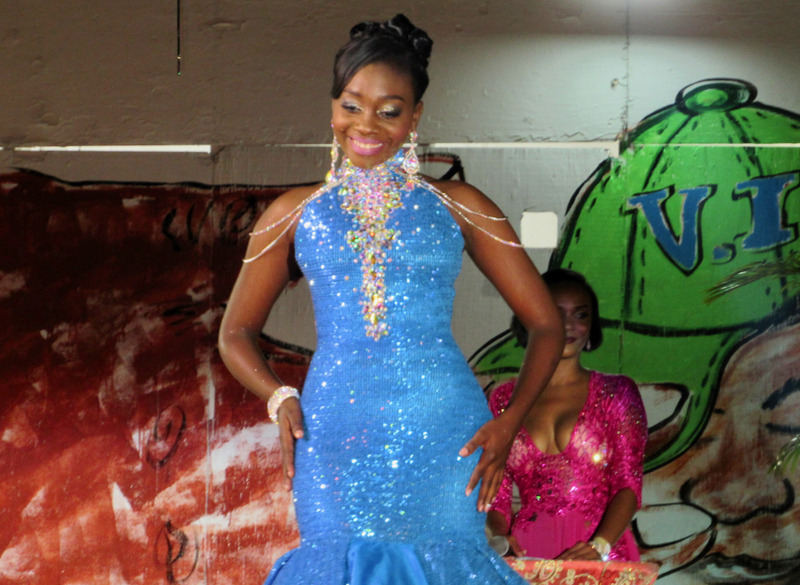 Carnival Queen Mary-Alice Prosper hosted a segment called Lady of Yesteryear, in which contestants were challenged to showcase an elaborate costume representing a woman that has made considerable contributions to the culture and history of the Virgin Islands. 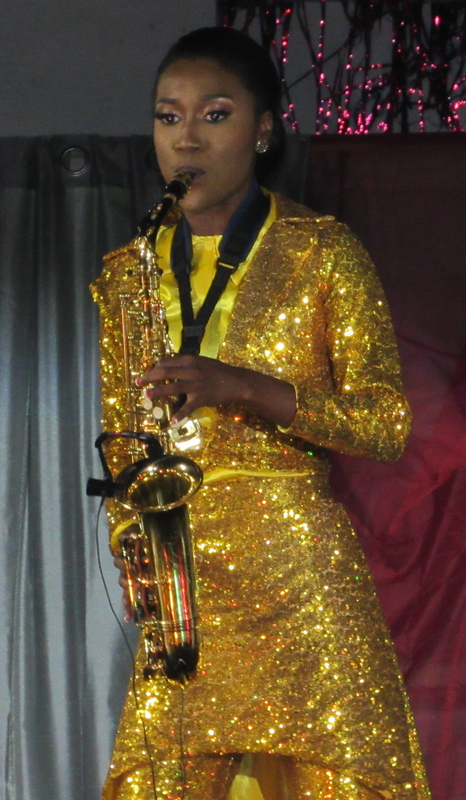 Jahnique Francis plays saxophone in the talent segment. Michael portrayed Dorothy “Dotsey” Lockhart-Elskoe. 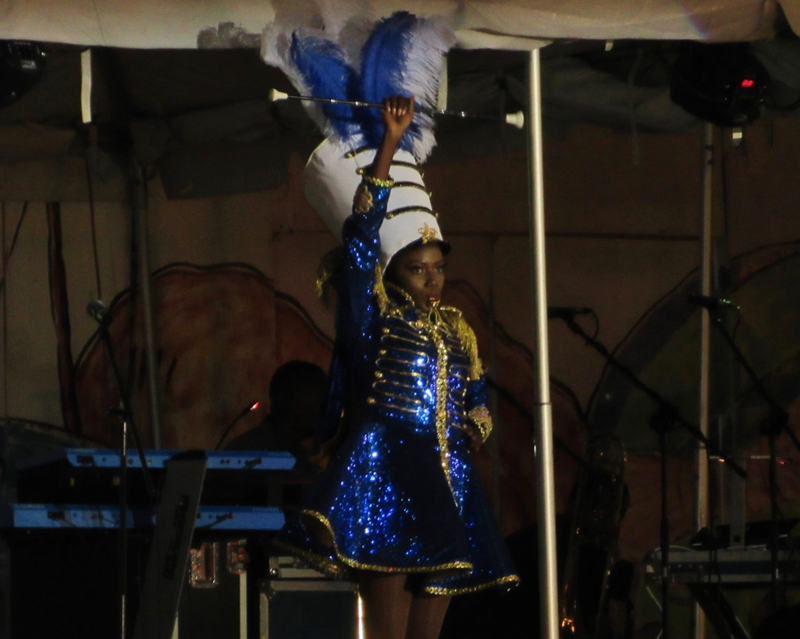 Her costume featured bright feathers to represent the Elskoe and Associates Carnival Troupe, and detailed panels depicting Elskoe’s contributions to education and politics throughout the territory. 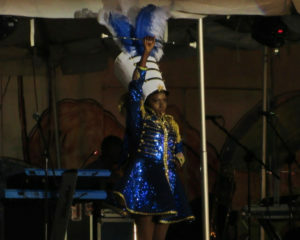 Williams’ presentation contained multiple costume changes as she portrayed Helen Sebastien-Gabriel of the Sebastien Majorettes. Each change represented a different costume worn by members of the group, chronicling achievements such as their induction into the National Baton Twirling Association, and competing in in Belgium. Francis portrayed Felicita Donastorg, who served the U.S. Virgin Islands as a nurse and educator. Francis’ costume also featured a headdress covered in thimbles, and sewn dolls within the skirt to honor Donastorg’s work as a dedicated seamstress for former pageant royalty. Williams performed a dance routine that told the story of an Akwamu queen. Francis played the saxophone in a presentation called “V.I. Strong”, in which she honored the strength and tenacity of the territory following two major hurricanes. Sponsors for this year’s pageant include Color Maxx, Heavy Materials, Cardow Jewelers, Kmart, and the Department of Tourism. The event also saw performances from the Charming Twirlers and Cool Session Brass. Editor’s Note: This story has been modified to correct the name of the winner.